It is about 683 from Las Vegas to Keystone Bike Park in Dillon, Colorado. According to Google Maps that’s approximately 9 hours, 40 minutes of drive time. After wrapping up a wedding shoot on Sunday, my good friend (and biking partner) and I jumped in the wagon and headed for Denver to spend a couple days riding cross country and downhill at the Bike Park. I have duel Yakima Cobra Racks that are currently sporting two, KHS 304 Mountain Bikes. We call these our “tweener” bikes. 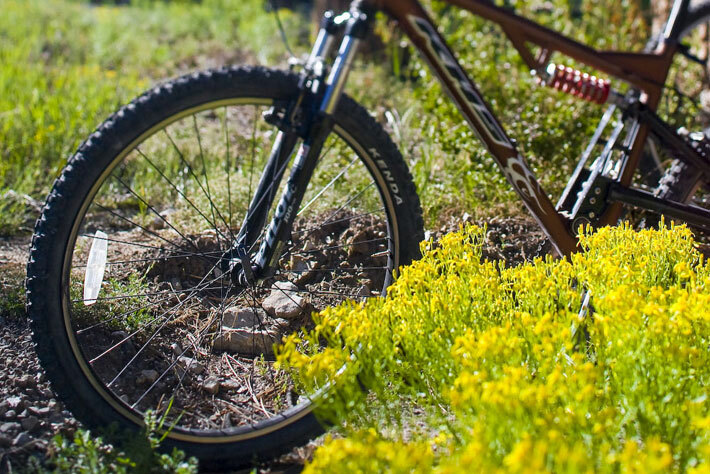 Light weight, but rigid, with about 3 inches of play in the front and rear shocks, these 8 speed mountain bikes are a nice blend of cross country and uphill as well as versatile enough for some light to moderate downhill (with a little experience). So anyway, after nearly 12 hours of driving through the night, (not 9 like Google suggested), and 3 hours of sleep at a friend’s beautiful mountain home, we arrived at the River Run village and hopped on the Ski lift for a ride to the top of Dercum Mountain and the beginning of the 5 mile system of trails to the bottom. I will be writing a review of the trails in a later article for mtobikes.com but suffice to say that after only 15 minutes of riding, my buddy misjudged a jump that resulted in a 3rd degree fracture of his collar bone. 12 hours of driving, 683 miles worth of gas, 3 hours of sleep, two days worth of lift tickets and McDonalds for breakfast……$450.00. The look on my partners face after only 15 minutes of riding, knowing we were done and heading home… well you know the answer to that…. Spent the day with Matthew & Roxy. Saturday was their wedding day and we began at the Green Valley Ranch for some getting ready shots before moving to the Revere Golf club for the ceremony and a really fun, lively reception. The couple reserved the entire venue and the whole feel of the party was club like, yet intimate. As the guests finished dinner, we were able to sneak off unnoticed for a few minutes, to capture some romantic shots as the sun set over Las Vegas. To Roxy and Matt – thanks for your hospitality and for trusting me to “get all the shots”. Here’s a teaser and I can hardly wait to show you the rest…….